A few weeks ago a friend of mine came to me with a well known knitting magazine which pictured a cable pattern swatch. Her problem was that what she was knitting did not match up with the pattern and also that in some rows the number of stitches were not correct. I worked on the pattern and after some initial confusion I found that in some rows the writer had forgotten to add in the background stitches. 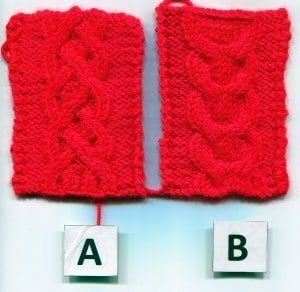 Also the picture in the magazine was for Cable B while the pattern was for Cable A! If you like a challenge try Cable A – it is quite difficult. Cable B is much simpler but also gives a very attractive design. These 16 rows form the pattern. Repeat as necessary. These 8 rows form the pattern. Repeat as necessary.